Jonah the Reluctant Prophet, son of Amittai, was a prophet who disobeyed God when he was given a task. Jonah is best known as the prophet who was swallowed by a large fish. God instructed Jonah to go to the City of Nineveh and cry out against their wickedness. Being reluctant, Jonah did not obey the Lord and boarded a ship headed to Tarshish. A great storm hit the ship as Jonah slept; the sailors were praying to their gods while throwing out all goods from the ship to lighten the load, but to no avail. The captain of the ship found Jonah and roused him to call upon God to help them. The sailors decided to cast lots to see who brought this bad luck on the ship and it pointed to Jonah. They questioned Jonah as to the cause of the storm and he told them he was running from the Lord. The sailors then asked what they should do now to calm the seas and Jonah told them to throw him in the sea. A large fish, often thought to be a large whale, swallowed Jonah the Reluctant Prophet after he was thrown into the sea. 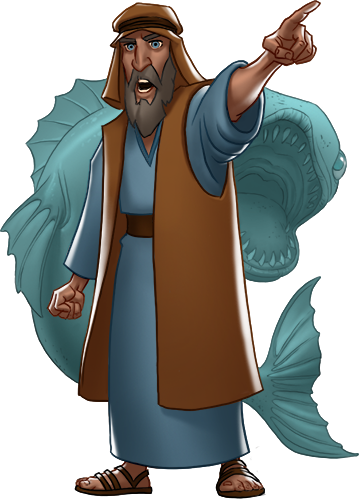 While in the fish, Jonah prayed and repented from his sin, especially for disobeying God. After three days, the fish spewed him out on dry land. The Lord again instructed Jonah to go to Nineveh to preach to the people so they might turn from their wicked ways or the city would be punished for 40 days. Jonah’s warning was heard by the people of Nineveh; the people repented, and God relented. God spared the people of the city. After this, Jonah the Reluctant Prophet was angry and questioned the Lord because He spared the people of Nineveh. When Jonah got out of the city, he stopped to rest. God provided Jonah a plant for shelter. Jonah was happy, but the next day, God placed a worm on the plant and it died. Jonah complained again. For this, God scolded Jonah for being worried about a single plant, but not about Nineveh which could have lost over 120,000 people.